archaeo-astronomical discoveries in the Egyptian Sahara oasis of Siwa. Take a sneak peek HERE, and pre-order your copy by simply contacting us stating your interest in acquiring one. We will subsequently let you know when it is available for purchase. regarding the Timasirayn Temple / Amun Oracle Equinox Alignment discovery HERE. 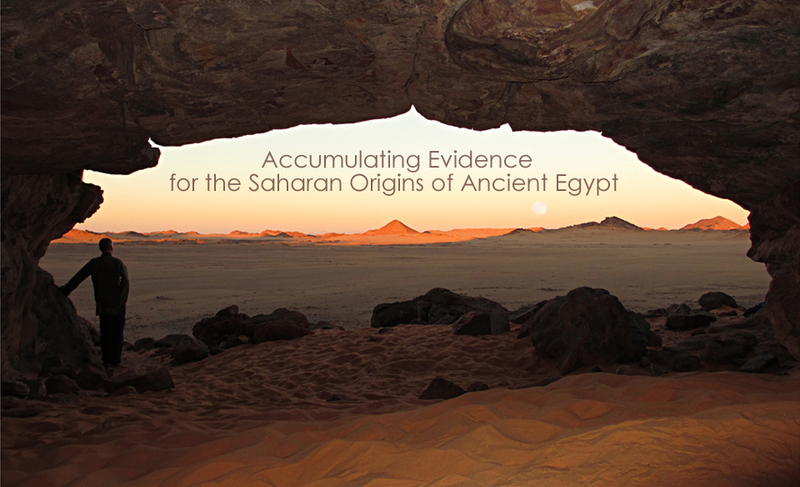 • There are a few other Egyptian-based news articles on this discovery linked in the Resources section. • Confirmed: New discovery at the Amun Oracle Temple in Siwa Oasis, Egypt! The Source In The Sahara's Dustin T. Donaldson and Robynn Iwata spent a full year watching the slow-moving behaviour of the sun's rays across an inner sanctum wall deep in the Amun Oracle at Siwa Oasis, Egypt. Ultimately, on only two days a year, 6 months apart, the light beam, which is allowed into the building by a small high outside window, moves into perfect alignment with another very special opening even deeper inside the structure—the window to the holy sanctuary of the god Amun! Throughout the course of the year, the proofs of the find—which has been hiding in plain sight for probably at least 1,600 years—were documented. This includes the first ever photograph of a human being lit by the Sun through the Equinox-related, double-window alignment (In the glory days of the Oracle it was the Amun statue itself in this position). This amazing new discovery of Ancient Egyptian solar-mechanics (Archaeo-astronomy) was reported to, witnessed by, and accepted by the Siwa Council Of Egyptian Antiquities on March 8th, 2015 at the Amun Oracle Temple. the 'Amun Oracle Inner Sanctum Double-Window Alignment' Discovery and 'Ritual Festival Theory' is HERE. 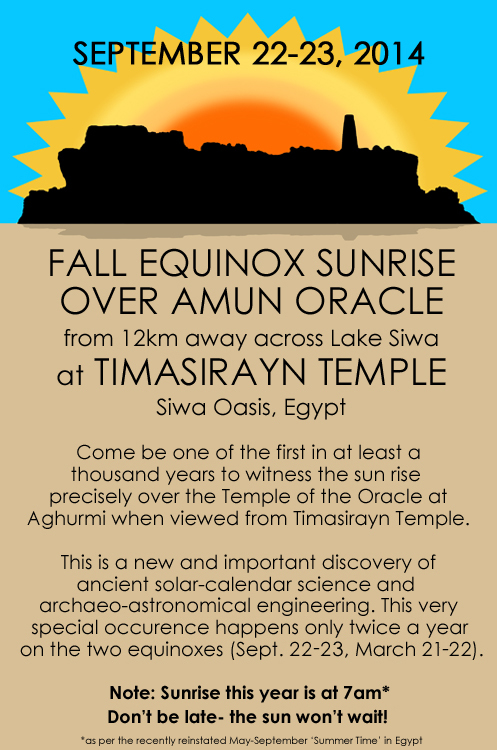 • Meanwhile, in related Equinox-alignment news, we are excited to report that the second ever public Timasirayn Temple/Amun Oracle Spring Equinox alignment viewing (March 21, 2015) was graced by the presence of the Mayor of Siwa as well as a group of select city council members and other local dignitaries. The addition of a total solar eclipse the day before made for a very memorable occasion in Siwa Oasis. • We were recently honoured by Siwa's Abdu Restaurant and Tanta Waa Cafe at the Cleopatra Spring when they each asked us for a framed photo of our Timasirayn Temple / Amun Oracle Equinox Alignment discovery. HERE are pictures of us at the locations when we delivered them in the frames that we hand-built. • There is a new page about the mysterious and rarely-visited 'Bagnold's Stone Circle' in the NE Gilf Kebir Plateau (SW Egyptian Sahara) HERE. • Dustin T. Donaldson and Robynn Iwata, the proprietors here at TheSourceInTheSahara.com, have recently completed the editing and translation of modern desert exploration pioneer Mahmoud Marai's upcoming book Travels In The Setting Sun: A Diary Of Explorations And Discoveries In The Egyptian Sahara (release date tba). An EXCLUSIVE EXCERPT will be found on the upcoming 'Kingdom Of Yam' page here at TheSourceInTheSahara.com. 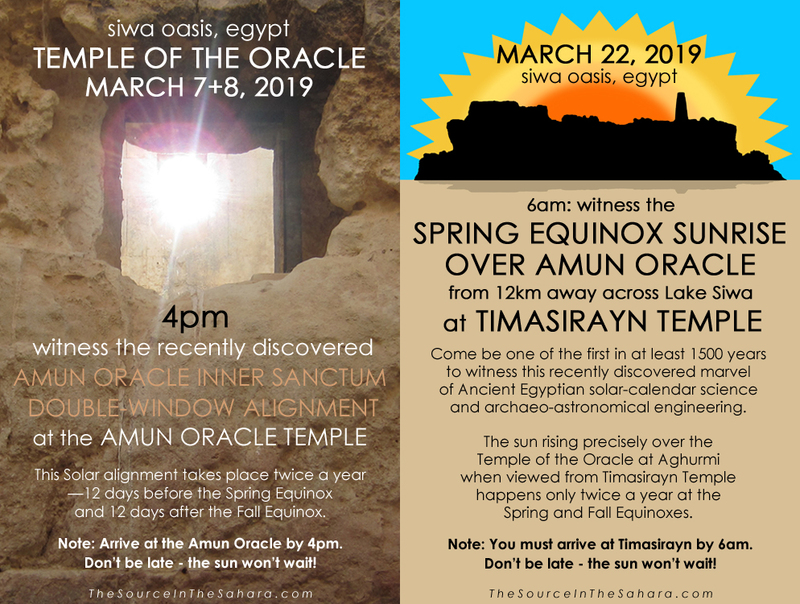 • The first ever—well, in at least 1,500 years, likely—public witnessing/viewing of the spring equinox sunrise over Aghurmi/Amun Oracle from the reborn Timasirayn temple happened on March 21st, 2014 in Siwa, Egypt. There were 45 or so lucky attendees, who all gasped in astonishment as the minute-long event transpired. Elation followed as the reality of this masterpiece of ancient solar-calendar science sunk in. Immediately beforehand, co-discoverer Dustin Donaldson gave an impromptu 15 minute discourse on the engine/mechanics of the Earth's axial tilt and subsequent results that lead to the seasons, solstices, and the balanced day/night configuration that marks the equinoctial moment twice a year. Co-discoverer Robynn Iwata documented the proceedings. Fantastic weather made for a perfect time. All content © 2008-2019, Donaldson/Iwata for The Source In The Sahara and Mesmer Detector, Ltd, unless otherwise noted. Media and website/blog photo use permitted ONLY if credited to TheSourceInTheSahara.com. Please notify us if you use the images or any other content. All rights reside with the content owners. Press and media, please see the CONTACT page.